Click here to hear wild Austalia. On the foreshores of Sydney Harbour and overlooking Pittwater in Sydney's modern northern suburbs lie sandstone engravings of untold antiquity. They tell tales from the Dreaming of the region's first inhabitants, the Aboriginal people, who lived around the hills and waterways for thousands of years — perhaps 100,000. Yet, the story of Sydney began 26 January 1788, when British captain Arthur Phillip's First Fleet landed at the harbour's Sydney Cove. His ships carried about 1030 people, mostly convicts from Britain's prisons. Twelve days later, Phillip proclaimed the colony of New South Wales. The first free settlers joined the colony in 1793, and, in 1810, Governor Lachlan Macquarie began a stable, productive rule. New settlements were established, and urban development of Sydney, named after Lord Thomas Townshend Sydney, began in earnest. More than 200 years later, handsome buildings designed by colonial architect Francis Greenway, including the Hyde Park Barracks, the Mint and the old Supreme Court, stand at the top of Macquarie Street. They offer enduring monuments to Gov. Macquarie's energy and enterprise. Inland exploration of New South Wales began in 1813 with the discovery of a route over the previously impenetrable Blue Mountains, just outside the city's present western outskirts. It opened the way to the rich pastures just on the other side. By 1819, 26,000 people lived in New South Wales, 10,000 of them convicts. Despite the great initial hardships, the colony continued to grow and develop and, by 1827, was self-supporting. New South Wales Art Gallery. Australian Tourism Commission. Sydney grew steadily as land across New South Wales was cleared for cropping and grazing. In 1842, just two years after the transportation of convicts to New South Wales was abolished, Sydney officially was declared a city. In 1851, gold fever struck. Payable deposits were discovered at Bathurst, 200 kilometres west of the city, and migrants joined locals in a profitable rush that lasted a decade. It stimulated economic growth and carried the colony's population over 300,000. New South Wales celebrated its continuing prosperity in 1888, its centenary, by dedicating Centennial Park in eastern Sydney. The vast green spaces, dotted with lakes, remain a cornerstone of the city for both residents and visitors more than another century later. Over the next three decades, New South Wales joined with the other states to form the Commonwealth of Australia, and the country soon was sending many of its young men to World War I. A few years after the war ended, Sydney became a metropolis of 1 million people. Shortly after World War II, the Australian government began an immense project that changed the face of Sydney and the country. Construction of the Snowy Mountains Hydro-Electric Scheme began in 1949, and, soon, the need for skilled migrants from across Europe brought changes to immigration policy. For Sydney and New South Wales, in particular, it became a watershed, kick-starting the transition into the multicultural society of today. In 1955, another key change to the face of Sydney was brewing. An architect named Joern Utzon won an international competition to design Sydney's Opera House. Cosmopolitan Sydney comes of age Australia began to grow rapidly in the 1970s and 1980s, nowhere more quickly than Sydney. It evolved into a distinctive, thriving cosmopolitan city of almost 4 million people, becoming a financial centre for the Asia-Pacific region and the tourist gateway for visitors to Australia from around the world. 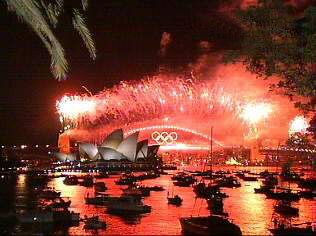 On 26 January 1988, 200 years after the First Fleet sailed into Sydney Cove, Australia celebrated its bicentenary. The national festivities focused particularly on Sydney Harbour, the birthplace of modern Australia. An estimated 1 million people thronged the harbour shores in an unprecedented expression of national feeling. Then the city of Sydney quickly moved on again. Later that year, work on the Sydney Harbour Tunnel began. Four years later, it opened on schedule. In 1993, when Juan Antonio Samaranch proclaimed "Syd-er-ney" had won the rights to hold the 2000 Olympic Games, the city exploded in celebration. Many residents had stayed up at parties in and around the city centre until the early-morning (Sydney time) announcement, watching big-screen televisions carrying the telecast. Heading into the 21st century, Sydney figures to remain the principal arrival point for visitors to Australia and to become an increasingly significant financial, commercial and cultural centre for the Asia-Pacific region.